Slice the Brinjal into thin rings. If the rings are big, cut them into half. Mix with salt, chilli powder, turmeric powder and keep aside. Beat the Yoghurt slightly till it becomes smooth (no lumps). In a Pan, heat oil and fry the Brinjal slices in batches till they are slightly crispy (not burnt). Remove and keep aside. Then fry the onions slices till they lose their rawness and remove. Then slightly fry the sliced green chillies. 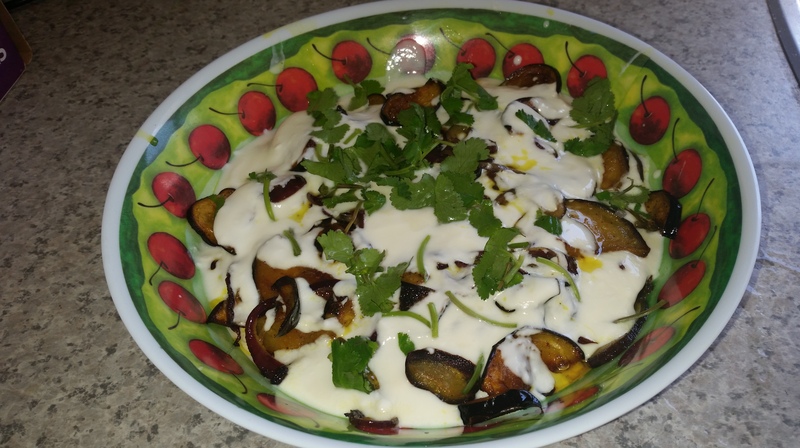 In a bowl make layers of fried Brinjal, Onions, chillies and yoghurt till all finished. Garnish with coriander leaves. You can serve it immediately or keep in fridge before serving.